Hundreds of people from the Chicago area and beyond enjoyed a special day at the Paul Hruby Ice Arena during the Intermission at Ridgeland Common celebration on Saturday, February 16. Attendees shared stories about the old facility and had the chance to learn more about renovation plans and the grand reopening of Ridgeland Common scheduled for 2014. Alumni from Fenwick and OPRF High School got things started with one of the last hockey games played on the old rink. After a ceremonial puck drop with Paul Hruby, Fenwick raced to a 5-1 lead before the Huskies alumni squad cut the deficit to 5-3. Fenwick won the game 7-3 adding a couple empty-netters at the end of regulation. Legendary Chicago Blackhawks organist Frank Pellico provided the soundtrack for the alumni game and the last public skate on the old rink. Attendees also had the opportunity to meet members of the Chicago Blackhawks Alumni Association, including Jack O’Callahan, Cliff Koroll, Phil Russell, Grant Mulvey and Reg Kerr. The former Hawks posed for photos and signed autographs for over an hour. In addition, Blackhawks mascot Tommy Hawk made an appearance, skating on the ice posing for pictures with kids and adults. Emily Blim performed her Ice Show routine with style and grace for an enthusiastic crowd. Then it was on to the last 45 minutes of the public skate. Dozens of great prizes were awarded in the Parks Foundation drawing, including a School of Rock camp, Blackhawks tickets and Park District ice rentals when the rink reopens in 2014. 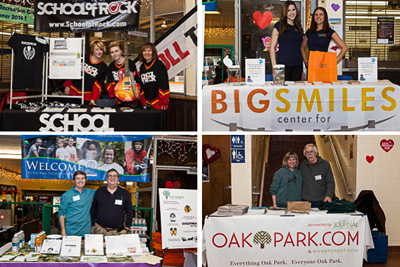 The Parks Foundation of Oak Park would like to thanks its event sponsors: Big Smiles Center for Orthodontic Excellence, School of Rock Oak Park, Wednesday Journal, DTKindler Photography and Vitamin Water. The Parks Foundation would also like to extend its gratitude to the staff at the Park District of Oak Park for all their behind-the-scenes efforts in making Intermission at Ridgeland Common a day to remember!